This is a soup without the addition of any liquid. The taste and the consistency is totally dependent on the quality of the tomatoes. Rinse, core and slice the tomatoes. Place them in a saucepan along with the garlic, olive oil and thyme. Bring to a gentle boil, cover and cook over low heat until the tomatoes are very soft, about 15 minutes. Stir occasionally. Discard the thyme and puree in a Vitamix until very smooth. Season with salt, pepper and sugar. Garnish with thyme. A delicious refreshing summer soup with a distinct taste of cucumbers, this recipe requires no cooking and is so quick to prepare. 2 tablespoons lime juice, approx. ¾ cup cold water, approx. 1 Kirby cucumber, rinsed, dried, trimmed and cut into very small cubes. Place all the ingredients in a Vitamix and puree till silky and smooth. Adjust the consistency with cold water. Season to taste with lime juice, salt and pepper. Serve chilled, garnished with cucumbers. This soup is a blend of interesting strong flavors. I serve it either at room temperature or hot. Heat the olive oil in a medium covered saucepan. Add onion and garlic and sauté over low heat for 5 minutes. Add 1½ cups broth, potatoes and tomatoes. Bring to a boil, reduce the heat and cook, covered, until potatoes are soft, about 30 minutes. Add watercress and cook covered for 2 minutes. Puree in a Vitamix, in 2 batches, until smooth. Adjust the consistency with the reserved broth. Season to taste with salt and pepper. Garnish with watercress petals. 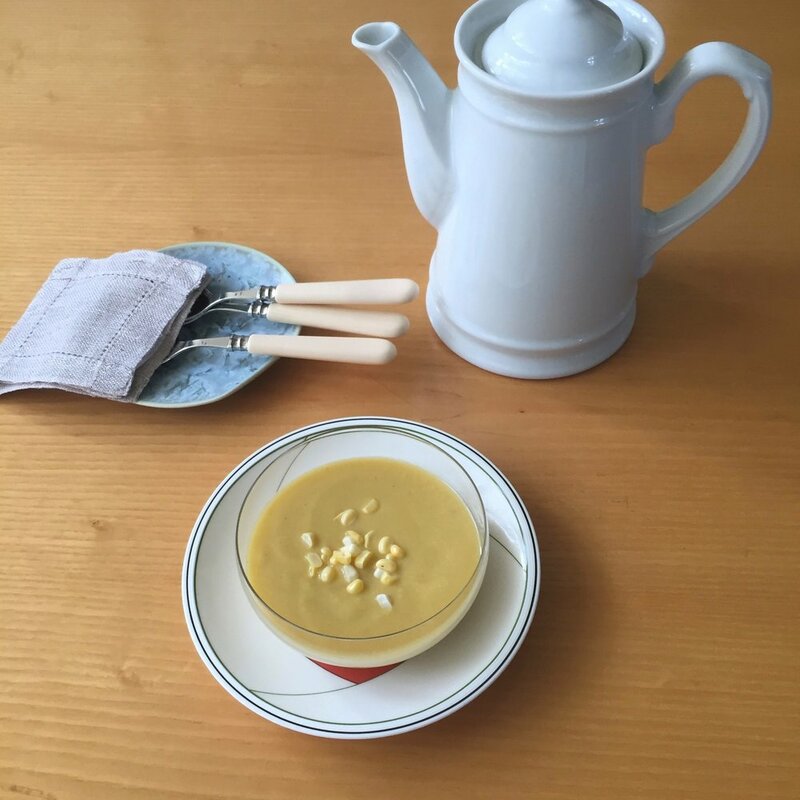 The combination of summer corn and summer yellow squash makes for a wonderful, nutritious and golden colored soup. I serve it warm or at room temperature. Heat the olive oil in a medium saucepan. Add the onion, garlic and sauté for a minute. Shuck the corn kernels, setting aside one of the ears for garnish. Rinse the squash and slice. Add the corn, zucchini and 2¼ cups of the broth to the saucepan. Bring to a boil over high heat. Lower the heat and cook, covered, for about 15 minutes or until tender. Puree the soup, in two batches, in a Vitamix until smooth and silky. Adjust the consistency with the reserved broth. Season with lime juice, salt and pepper. This is a refreshing creamy tomato soup which I like to serve cold or at room temperature on hot summer days. Unfortunately without a Vitamix the soup will have to be strained to remove the seeds and some of the skin. I like to serve it with a basil pesto but snipped chives are equally delicious and certainly less work. Place in an ovenproof dish that is large enough to hold the tomatoes in a single layer. Place the garlic underneath the tomatoes. Roast for 1 hour, turning the tomatoes once. Pour into a Vitamix and add ¾ cup vegetable broth. Puree until smooth. Adjust the consistency with the extra vegetable broth. Season to taste with sugar, balsamic vinegar, salt and pepper. Garnish with snipped chives. Use scissors. 1 cup dry white wine. Heat the oil in a medium saucepan. Add the onion and garlic and sauté for 5 minutes. Add the carrots, wine, 5 cups of broth, cumin, coriander, and chili powder. Bring to a boil over high heat. Lower the heat and cook, covered, for about 30 minutes, or until the carrots are tender. Puree the soup, in batches, in a Vitamiix until smooth. Adjust the consistency with the reserved broth. Season to taste with lemon juice, cumin, coriander, chili powder, salt and pepper. To serve: steam the remaining carrot until just tender. Grate coarsely and garnish. This recipe is a healthy, thick, hearty soup, to warm your heart on the bleakest days of winter. This soup also freezes very well. It is one of the few soups that I do not puree. In a large covered saucepan heat the olive oil. Add onions, garlic and jalapeno. Sautee covered over low heat for about 10 minutes. The onions should be soft. Stir in cumin and turmeric. Add lentils and 6 cups of broth. Bring to a boil over high heat, lower the heat and cook covered for about 15 minutes, until the lentils are tender. Adjust the seasoning with cumin, turmeric, salt, pepper and lime juice. This soup thickens a bit. When ready to serve, adjust the consistency with the reserved ½ cup of broth. Season to taste again. I chop finely the onions, garlic and jalapeno in a food processor. Be sure to quarter the ingredients first. When seeding jalapeno peppers, please wear thin plastic gloves to avoid irritating your skin or your eyes. 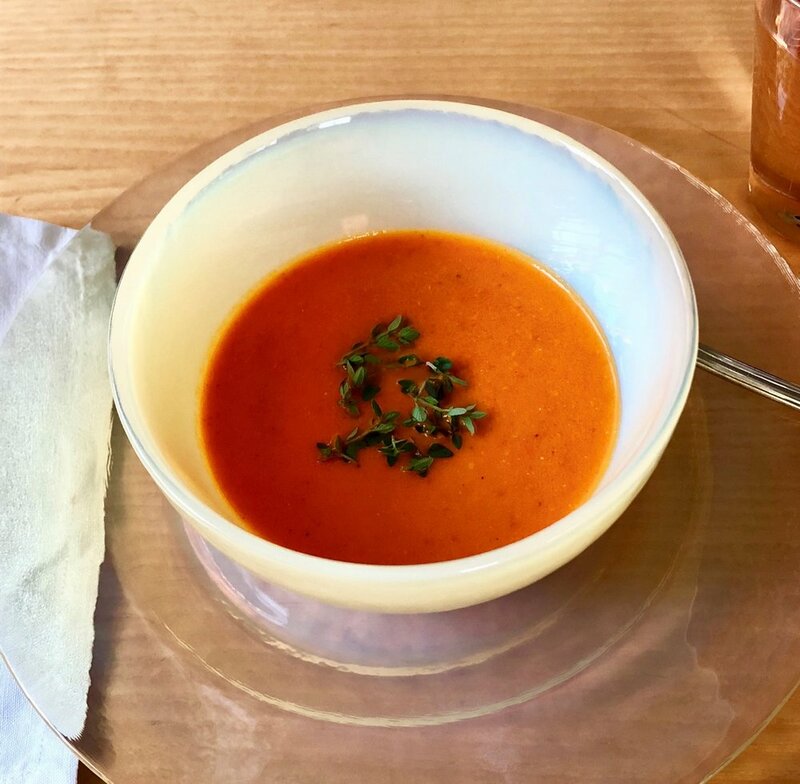 Since tomato season is very short – usually from July until early October or however long the warm days of early Fall remain – I urge you to take advantage and try this soup. If you like your gazpacho to be more nourishing, you may want to serve it with condiments, such as chopped seeded cucumber, chopped bell pepper, chopped red onion, chopped peeled tomato and croutons. Place all of the ingredients in a Vitamix and puree until very smooth. (If you like your soup a little coarser, puree it for a shorter time.) If your soup is not as thick as you like it add 1 slice gluten free whole wheat bread cut into pieces and puree. Season to taste with vinegar, salt and pepper and serve it very cold garnished with chives or the suggested condiments. When seeding jalapeno peppers, I advise wearing thin plastic gloves to avoid irritating your skin or your eyes. This is a hearty, flavorful winter soup. The touch of pesto definitely adds to the flavor. After the presentation, be sure to stir the pesto into the soup. Place beans into a bowl and cover with cold water. Heat the oil in a large covered saucepan and sauté onions and garlic for a few minutes. Add the beans and 6 cups of broth. Bring to a boil, lower the heat, and cook covered for20 minutes. Add the potatoes and cook for another 30 minutes or until the potatoes are soft. Strain the soup through the medium disc of a food mill and return to the saucepan. Adjust the consistency with the extra ½ cup of broth as needed. Season to taste with salt and pepper. Place basil and garlic into a food processor fitted with a steel blade. With the motor running add the oil very slowly through the feed tube and pulse until smooth. Transfer to a container and cover tightly to prevent discoloration. 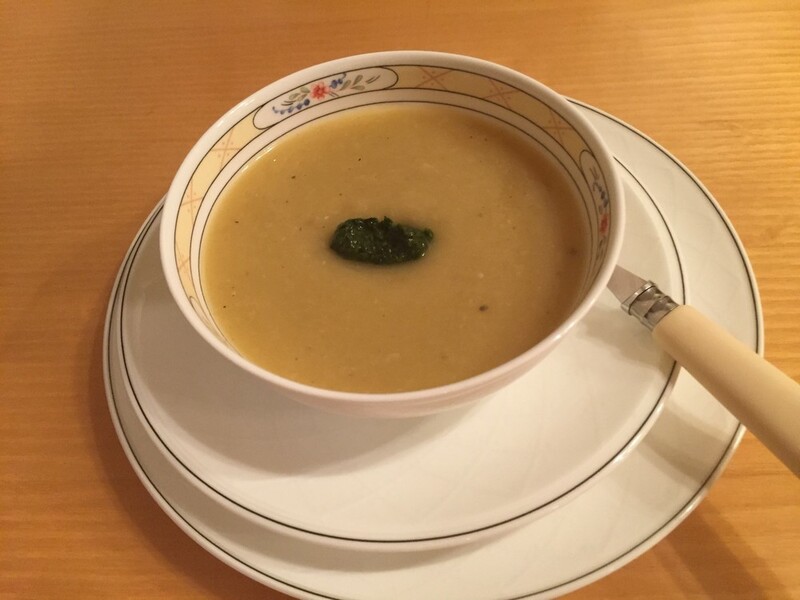 Ladle the soup into heated soup bowls, and place a generous teaspoon of garnish in the center. When reheating the soup, be sure to do it on a low to medium flame, otherwise the beans and the potatoes may begin to stick to the bottom. This is a hearty, nutritious, and flavorful winter soup that can almost be a meal in itself. It also freezes very well. Do not be discouraged by the chopping I do it all in a food processor. Place porcini mushrooms in a small bowl, pour boiling water over the mushrooms, cover and let stand for 15 minutes. Remove reconstituted mushrooms and squeeze dry. Set aside. Strain the mushroom liquid through a fine sieve and set aside. Wipe the white mushrooms with a damp paper towel. Trim the ends, quarter and chop finely in a food processor. Wipe the shiitake mushrooms, discard the stems, quarter and chop finely. Wipe the Portobello mushroom, cut into eights and chop finely together with the saved porcini mushrooms. Heat 2 tablespoons of the oil in a large saucepan. Add onion, garlic, carrot and sauté for a minute. Add the rest of the oil and all of the mushrooms. Sauté over high heat for a minute. Add the bulgur, kale, reserved mushroom liquid, vegetable broth and thyme. Bring to a boil over high heat. Lower the heat and cook covered for 20 minutes. Season to taste with salt and pepper. I suggest chopping all of the vegetables, in a food processor. I do the onions and garlic together, the carrots separately, and the mushrooms, each variety, separately.